Welcome to our Miami Beach Real Estate Blog. We are always looking for input so if you have any questions or comments we would welcome them. We strive to get only to give the best to our community. Look forward to hearing from you soon. That funky Tiffany lampshade, a unique mirror, the handblown glass the sculpture you got for your anniversary, all of these unique things are tricky to pack and carefully store and the last thing you want is to risk breaking it during your relocation. Here are some moving and packing hacks for those tricky or delicate items when it comes to relocating. First, remove any detachable parts from the tools and use rags or bubblewrap to protect sharp edges. Pack tools securely in a tool caddy or strong box and add extra packing like a newspaper or plastic bags around the tools to stop them from sliding and bumping into each other. Most televisions are pretty large these days and need careful handling. If you can, packet back in the original box and packing but if you don't, like most of us, wrap your monitor and pedestal carefully in a sheet or thick blanket and secure with duct tape or packing tape. Lampshades are best transported in a box and if possible, nest several shades together so that it can protect each other. Wrap with paper towels or plain paper but never newspaper as the print could come off on the shades. Place the tank on top of the strong box that's larger than the tank and line the base with bubblewrap. Aquariums are pretty heavy even without water so place layers of cardboard on top of the tank and add more packing to the box until it's full. Make sure you put fragile on the box. Remove all oil and gas from the mower before packing to avoid leaks and spills. Clean the mower, and wipe off all the grass to avoid the spread of quarantined plants and grasses. Wrap these items in bubble wrap or paper and secure it well with tape. Pack one or two items that are fragile in with other items for cushioning such as blankets, towels, and clothing. Pack fragile glass items in the center of a box filled with soft items. If you're concerned about movers damaging your precious items during packing and relocation, simply pack them yourself to ensure that you have a good cushion. Relocating to or from the Miami or Miami Beach real estate area? Use my website to search for all homes, moving tips, buying and selling advice, or to get in touch with a qualified, experienced real estate agent in Miami. Is a Bidding War on Real Estate a Good Thing for the Seller? 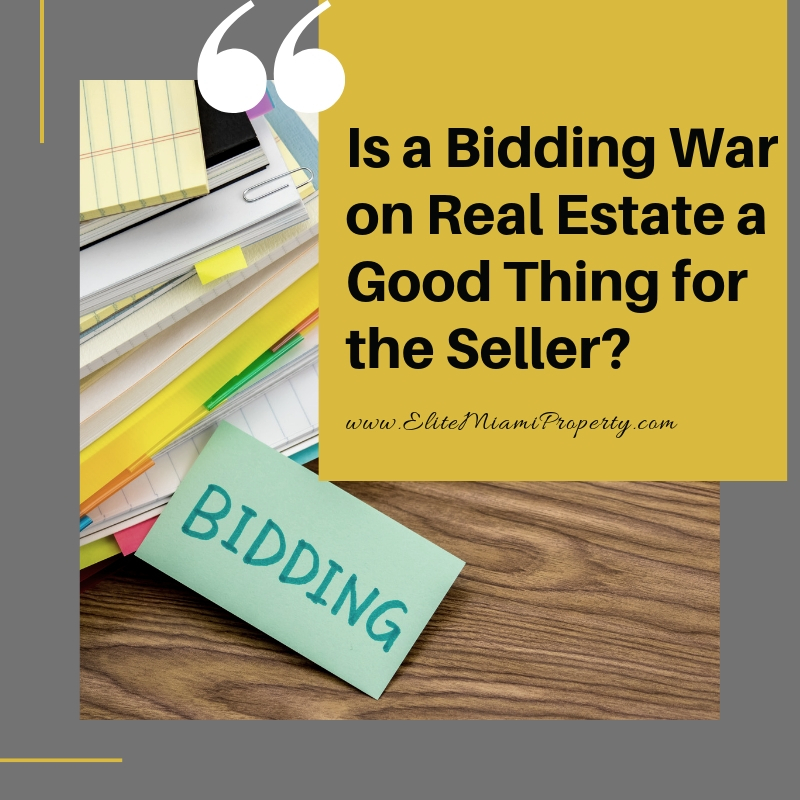 Bidding wars occur when there is a low supply of property listings combined with high demand from buyers. In today's hot markets across the country, bidding wars have become very common. Pricing your home competitively, or just slightly below market value or the closest competition, can easily invite a bidding war. While they can drive up the price, they are a little bit risky. If the final sales price ends up higher than the homes appraised value, it could cause financing problems for the buyer. If the buyer applies for financing, the home must be appraised for what the lender is willing to loan on the property. If the home doesn't appraise for the offer amount, the deal could fall apart. 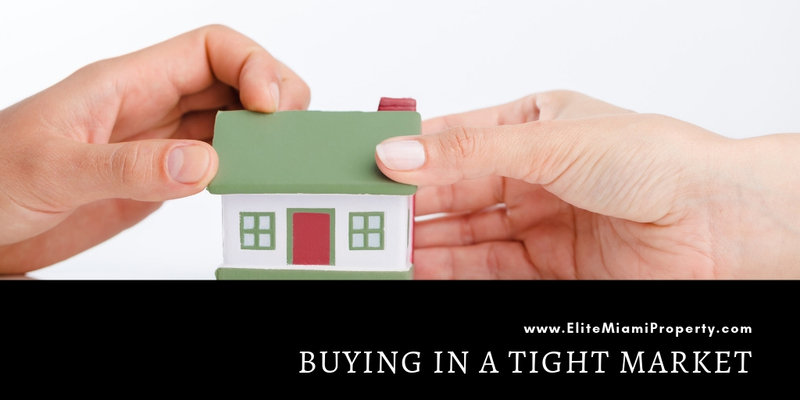 There are ways to still sell at the inflated price, but the buyer will usually have to bring more money to the table and then there's the fact that the buyer knows of the property isn't worth what they are paying for it. If the deal falls through, it could jeopardize other offers. Buyers may wonder if there's something wrong with the house that resulted in the previous deal falling through. While it's something as simple as a bidding war, it may deter other buyers from even making an offer. The last thing you want is for your bidding war strategy to backfire. In Miami, the difference between a seller's market and a buyers market literally changes from neighborhood to neighborhood. In higher-end neighborhoods, properties may not sell as quickly so bidding wars are not as common. In average or median home price neighborhoods, bidding wars are as hot as ever. So what should sellers do? While bidding wars can be a good thing for sellers, undergoing one doesn't mean that there necessarily the end-all to sell the house. Sometimes, the seller is the one that becomes the casualty so it's important to understand several factors when it comes to getting multiple offers. Don't automatically go for the highest offer. It can be easy to want to go for the highest offer right away but the strongest offer is not necessarily determined by price. Price is important, but terms are important as well. You might have a buyer that is offering a high price without a financing contingency, letter of preapproval, or ridiculous terms, which, it doesn't matter what the prices, the terms are unfavorable. Make sure you understand all the details of an offer, not just the price. Keep your emotions at bay. Getting too personal can cause you to make errors in overpricing the home in the first place. Sure, you love your home, and you can't imagine why someone would love it as well, but try to keep your emotions out of the situation. Some homebuyers are getting emotional as well by writing letters to sellers enclosing photos of their family and explaining why they would be the perfect people to live in the home. While that might sound endearing, it may not be ideal to accept those offers. Sellers need to stay objective and judge each offer on merit only. Don't let greed get in the way. This can be one of the biggest mistakes sellers make. If you get bids over your asking price you may be tempted to counter offer for even more. I mean, if more people want the home, maybe the ones that really wanted will pay even more. But that's just getting greedy. Remember, the goal is to sell the house, not to fight for the highest price when you are already getting over asking price for the property. The key is to go over every detail of an offer with your real estate agent. Because we understand the market we can help you make a wise decision having all of the information available to you. Construction on a news luxury Senior living the project will start in mid-2020 and will be completed within two years according to an article in the Real Deal.com. The Collection Residences in Coral Gables was originally a high-end luxury condo development and now is owned by Baptist Health South Florida and Belmont Village Senior Living to provide a luxury Senior living facility at 250 Bird Road. The 2.8-acre site was purchased in January for $37 million. This property was previously at the center of a lawsuit between developers planning to build 128 condominiums and retail space until the partnership ended three years ago and litigation pursuit. 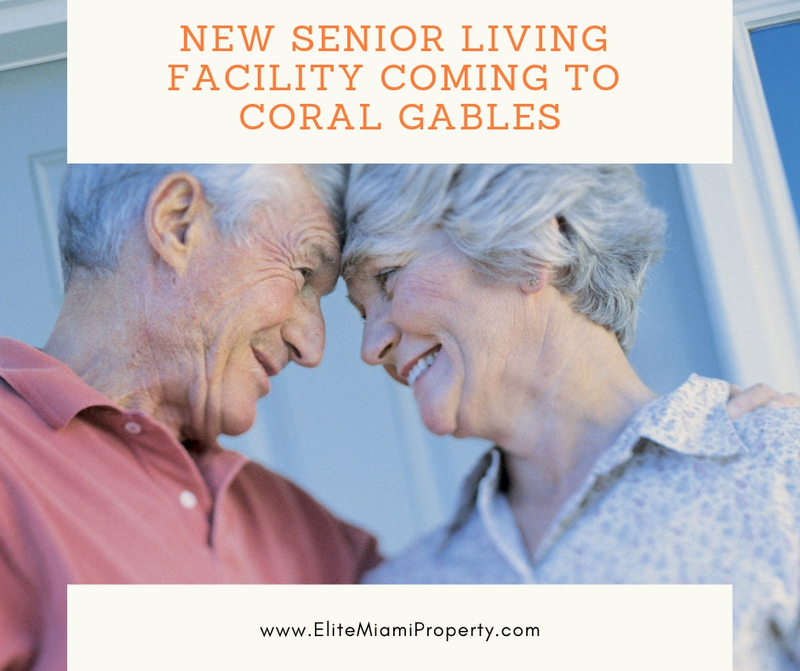 Baptist has been expanding throughout South Florida and plans to target the Miami-Dade County, Broward, Palm Beach, and Monroe County for their luxury Senior facility. Belmont Village currently has 29 properties with about 4000 units in seven states and Mexico City. It plans on future projects in Lincoln Park in Chicago and Fort Lauderdale. Baptist recently opened a four-story, 60,000 square-foot outpatient facility in Crescent Heights. Buying a brand-new home is exciting and a little overwhelming because you want to do it right and not have any regrets down the line. If you're considering buying a new home check out these five things to know before making that offer. You can find out in an instant what rates are and the terms to the home loan before making an offer. Use rate tools and talk to lenders so that you can make an informed decision about the right price and the right mortgage for your needs. Don't go into negotiations with a homeowner without knowing your numbers. Make sure you love the home exactly as you are getting it. Consider all the upgrades now so that you don't pay more later. A lot of times builders will throw in some customizations or upgrades, so make sure you know all of the details and upgrades before finalizing the deal. A new home might sound great but if it's in a school district that's less than desirable, you may have issues with variances or out of district schools. Schools are an issue for you, make sure that you approve the district or the zone before finalizing the offer. If you're moving somewhere completely new you'll need to adjust your daily routine. Are you close to where you'll buy groceries or the kind of services that are available nearby? What about coffee shops, local parks, and commute routes? Make sure the new home is where you want it to be. Safety and comfortability is key to finding a new home, whether it's new construction or a resell property. There are a lot of crime and safety resources out there to discover if this is a safe neighborhood or community. Before making an offer on any type of home, double checking your surroundings and the customizations of your home will put you in a better spot overall. Plus, you're less likely to regret your decision. Give me a call for a list of all new construction properties in and around Miami and Miami Beach. There's something comforting and secure about enjoying where you live for decades, longing to your retirement years. But, if you're planning on retiring where you are, you may want to change a few things at home rather than looking for a new place to live. A lot of baby boomers are actually staying in place, primarily due to kids and grandkids coming home or staying a while. But, maybe you just love your home or location, neighbors, or the convenience of where you are. 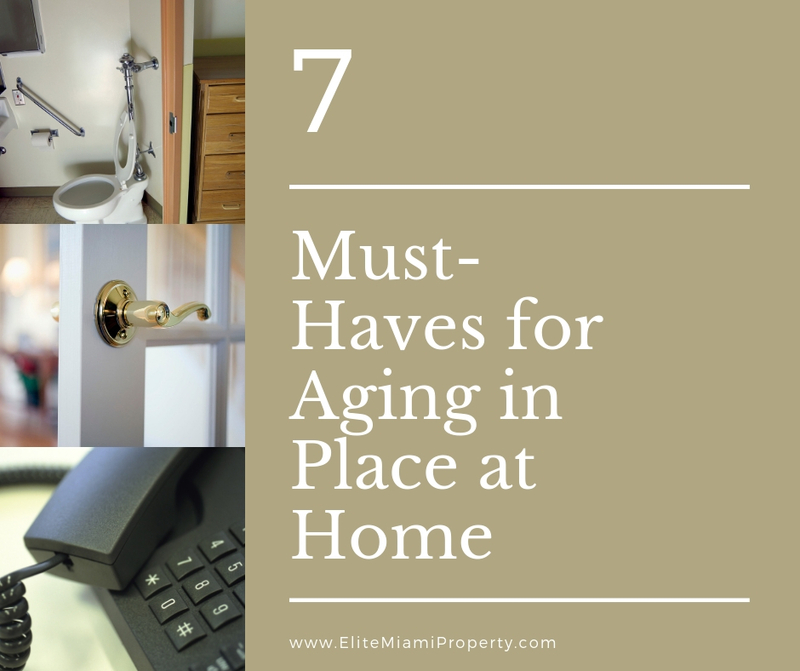 If that's the case, you may want to stay in your home for the next couple of decades and if so, here are some great must-haves to consider buying. Change out your doorknobs to levers. This simple change can make it easier to operate door hardware for anyone suffering from arthritis or has issues with their joints. Changing out hard flooring to soft carpet. This not only feels better on your feet and your joints, but could soften a fall as well. Make adjustments to bathrooms. Grab bars, comfort height toilets, and soft drugs can really make a huge difference in the bathroom. Many of these new designs can be decorative as well as useful. You don't need to look like a nursing home to make your bathroom more convenient. Convenient telephones. Having touchtone telephones with large buttons, speakers, or hands-free capability, as well as a text capability for those who are deaf or hard of hearing, might be a great option. Automatic shut off safety devices for kitchen appliances. This also might be a good thing to consider looking into. If you are out and about and can't remember if you turned off the stove or left the dishwasher running, it might be a good idea to look into options that allow for automatic shut off safety devices. Ramps for entryways. Installing a ramp or rail bars for stairs might be a good idea as well as installing a sturdier railing along all staircases. Mobility aids might also be a good option such as a walker, motorized scooter, or just simply a cane. Step in or walk in bathtub/shower. Many bathtubs and showers can be converted fairly easy these days. You might also consider a transfer bench for a bathtub or shower and a hand-held shower head or grab bars in the shower. Whether you're looking to modify your existing home to enjoy it for years to come or home that may already have all of these, this is a good list of things that you may not consider now but in 10 years will be a joy to have. Condominium buying is a little bit different than buying a single-family home. You obviously have shared space with other condo owners or renters and you usually have to fall within certain guidelines, bylaws, and rules, so your little bit more restricted, but, on the other hand, you have a lot less maintenance than a single-family house. You won't have to worry about the roof or the siding, landscaping or maintaining amenities, but there's always a trade-off. Most condominiums will have amenities and special assessments as well as homeowner association fees and dues you'll need to pay for. When looking for a condo keep these items in mine and avoid the mistakes by understanding all of the rules ahead of time. #1. Check out the location, not just the unit. Some condominiums look great on paper or on the online listing, but when you actually get there you realize this is the best-looking building in the neighborhood. Everything else needs a lot of TLC. Do you want to live next to broken down buildings that need a lot of repairs? This could bring down your property values. On the other hand, do a little bit of research on future development. If you know that this is an up-and-coming neighborhood, this building could be just the start to a new and vitalize community. Within 10 years, your property values could skyrocket. #2. Understand all the fees involved. 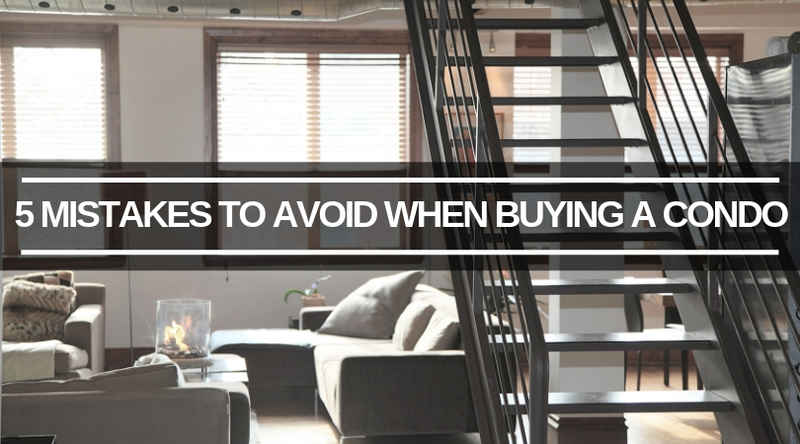 Buying a house is different than buying a condo. There are extra taxes, fees, application costs, homeowner association dues, and potentially many other costs not associated with a single-family house. Talk to your lender about all fees involved. A $2000 mortgage could easily be $3000 once you add in all the additional fees, insurance, and taxes. #3. Do the amenities fit your lifestyle? Are you paying $1000 a month for amenities you'll never use? This could be worth it if everything else makes sense. Do you love the view, the unit, the location? These things may overpower the extra fees it takes to maintain the amenities but weigh the costs. If the amenities provide things you'll use all of the time, those extra fees and costs may be well worth it to you. However, if you're paying for a dog park services, car washing amenities, and things you'll never use, you might want to search for a unit that better fits your lifestyle. #4. Do the rules and regulations work for you? All buildings have what's called CC & R's or covenants, conditions, and restrictions. These bylaws regulate the rules that all condo owners and tenants must abide by. If there's something in these rules you don't agree with, you can either talk to the Association about it or choose a different unit. You'll get a copy of these before finalizing the transaction, so make sure you read through them or have a real estate attorney do so for you. Related: Who should attend your condo inspection? #5. Understand who lives there. This is in no way to be discriminatory against anyone but, if you are retired and you're looking for a quieter building, a development with a lot of millennial's are college-age students may not work for your lifestyle. On the flipside, if you're looking for a high activity building, you probably are not looking for an adult only, 55 and over property either. Find a building that works for your lifestyle with folks of similar habits and behaviors. These are just some basics that everyone looking for a condo should know. You don't want to choose the wrong property only to be stuck with it for several years before you can afford to sell it. Doing your research and homework ahead of time will help you choose the right condo in the right building for your needs, daily lifestyle, and budget. While the rest of the country is in a deep freeze, were enjoying moderate temperatures in the Miami and Miami Beach area. 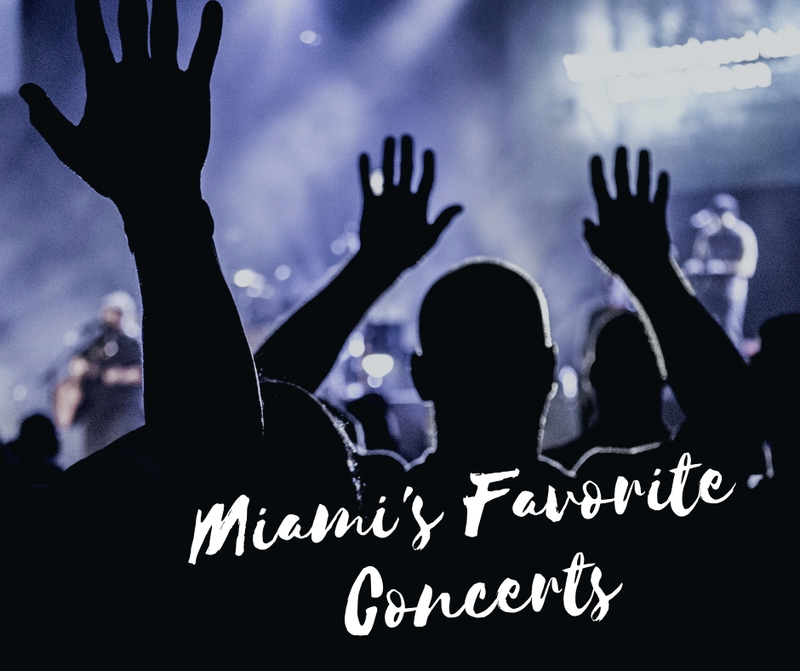 So, if you're looking to get out there and find a little entertainment, here are some of the best concerts and music venues going on around Miami and Miami Beach from February 5 through the 10th. Escaping Pavement: 9 p.m., Free. Lagniappe, 3425 NE Second Ave., Miami, 305-576-0108, lagniappehouse.com. Grizfolk: With Natalie Claro, 7:30 p.m., $13. Gramps, 176 NW 24th St., Miami, 305-699-2669, gramps.com. International Noise Conference: 9 p.m., Free. Churchill's Pub, 5501 NE Second Ave., Miami, 305-757-1807, churchillspub.com. Jaui Schneider and Lavie: 7 p.m., Free. Rouge, 908 71st St., Miami Beach, 305-720-9125, rougemiamibeach.com. Soul Glo and Zeta: 7 p.m., $5-$10. Sweat Records, 5505 NE Second Ave., Miami, 786-693-9309, sweatrecordsmiami.com. World Music Tuesdays: With Ana Sucha, 8 p.m., Free. The Wynwood Yard, 56 NW 29th St., Miami, 305-351-0366, thewynwoodyard.com. Al Di Meola: 7:30 p.m., $33-$43. Parker Playhouse, 707 NE Eighth St., Fort Lauderdale, 954-761-5374, parkerplayhouse.com. Israel Philharmonic Orchestra: 8 p.m., $50-$170. Adrienne Arsht Center for the Performing Arts, 1300 Biscayne Blvd., Miami, 305-949-6722, arshtcenter.org. Jazz at the Yard: With Electric Kif, 8 p.m., Free. The Wynwood Yard, 56 NW 29th St., Miami, 305-351-0366, thewynwoodyard.com. m.O.N.R.O.E B2B Adysin: 10 p.m., $10. Do Not Sit on the Furniture, 423 16th St., Miami Beach, 510-550-5067, donotsitonthefurniture.com. New Music Miami Festival: 7 p.m., Free. FIU Miami Beach Urban Studios, 420 Lincoln Rd., Miami Beach, 305-535-1463, carta.fiu.edu/mbus. Peter Murphy: 7:30 p.m., $35-$200. The Ground, 34 NE 11th St., Miami, 305-375-0001, thegroundmiami.com. Sirsy: 9 p.m., Free. Lagniappe, 3425 NE Second Ave., Miami, 305-576-0108, lagniappehouse.com. Words & Wine Open Mic: With Early Bird and the Rest, 8:30 p.m., Free. Las Rosas, 2898 NW Seventh Ave., Miami, 786-780-2700, lasrosasbar.com. Bruno Schmidt: With Mikey Bird, 10 p.m., $10. Electric Pickle, 2826 N. Miami Ave., Miami, 305-456-5613, electricpicklemiami.com. Excelsis Tenebrae: With Amenorrhea, Maedusa, and the Glorious Death, 9 p.m., Free. Las Rosas, 2898 NW Seventh Ave., Miami, 786-780-2700, lasrosasbar.com. G. Love & Special Sauce: 8 p.m., $24.99. Culture Room, 3045 N. Federal Hwy., Fort Lauderdale, 954-564-1074, cultureroom.net. Jason Rault: With Kyle Dasent-Elliott and Fabrizio Zerlini, 10 p.m., $10-$20. Do Not Sit on the Furniture, 423 16th St., Miami Beach, 510-550-5067, donotsitonthefurniture.com. Nugrau: 8 p.m., Free. The Wynwood Yard, 56 NW 29th St., Miami, 305-351-0366, thewynwoodyard.com. Skatebård: 10 p.m., $10-$20. Floyd Miami, 34 NE 11th St., Miami, 786-618-9447, floydmiami.com. Wynwood String Band: 9 p.m., Free. Lagniappe, 3425 NE Second Ave., Miami, 305-576-0108, lagniappehouse.com. American Darling Valve: 7 p.m., Free. Lagniappe, 3425 NE Second Ave., Miami, 305-576-0108, lagniappehouse.com. Caspa: 9 p.m., $20-$30. The Hangar, 60 NE 11th St., Miami, 305-702-3257, hangar305.com. Cortadito: 10 a.m., Free. Lagniappe, 3425 NE Second Ave., Miami, 305-576-0108, lagniappehouse.com. Gianluca Vacchi: 11 p.m., $30. Story Nightclub, 136 Collins Ave., Miami Beach, 305-538-2424, storymiami.com. Gloria Gaynor: 8 p.m., $60-$120. Charles F. Dodge City Center, 601 City Center Way, Pembroke Pines, 954-392-9480, charlesfdodgecitycenter.com. GroundUp Music Festival: With Snarky Puppy, Andrew Bird, Lalah Hathaway, David Crosby, and others, 2-11 p.m., $85-$825. North Beach Bandshell, 7275 Collins Ave., Miami Beach, 305-672-5202, northbeachbandshell.com. Jazz in the Key of Ellison: With Will Downing, Nona Hendryx, Quiana Lynell, Nicholas Payton, and the Andy Farber Jazz Orchestra, 8 p.m., $45-$125. Adrienne Arsht Center for the Performing Arts, 1300 Biscayne Blvd., Miami, 305-949-6722, arshtcenter.org. Juanabe: 8 p.m., Free. The Wynwood Yard, 56 NW 29th St., Miami, 305-351-0366, thewynwoodyard.com. Kintar & Mirko Loko: 10 p.m., Free-$20. Do Not Sit on the Furniture, 423 16th St., Miami Beach, 510-550-5067, donotsitonthefurniture.com. Marcus Amaya Band: 10 p.m., Free. Stache, 109 SW Second Ave., Fort Lauderdale, 954-449-1044, stacheftl.com. Markem: With Malone and Archila, 10 p.m., Free. Black Market Miami, 168 SW First St., Miami, 305-400-8023, blackmarketmiami.com. Max Graham: With Julian Perez, 11 p.m., $10. Treehouse, 323 23rd St., Miami Beach, 305-614-4478, treehousemiami.com. Melissa Manchester: 8 p.m., $60-$65. Aventura Arts & Cultural Center, 3385 NE 188th St., Aventura, 877-311-7469, aventuracenter.org. Nirvanna — Tribute to Nirvana: 8 p.m., $13. Revolution Live, 100 SW Third Ave., Fort Lauderdale, 954-449-1025, jointherevolution.net. Ruckus: 11 p.m., $40. LIV, 4441 Collins Ave., Miami Beach, 305-674-4680, livnightclub.com. Ryan Crosson: 11 p.m., $10. Floyd Miami, 34 NE 11th St., Miami, 786-618-9447, floydmiami.com. Shawn Mullins: 8 p.m., $32.50. Abdo New River Room at the Broward Center, 201 SW Fifth Ave., Fort Lauderdale, 954-462-0222, browardcenter.org. Solsis and Los Immigrantes: 9 p.m., $12. Open Stage Club, 2325 Galiano St., Coral Gables, 305-441-7902, openstageclub.com. Third World: With Jo Mersa Marley, 6 p.m., Free. Palm Court, 140 NE 39th St., Miami, 305-722-7100, miamidesigndistrict.net. Tin Man: 10 p.m., $10-$15. Electric Pickle, 2826 N. Miami Ave., Miami, 305-456-5613, electricpicklemiami.com. Tribalistas: 8 p.m., $48-$128. The Fillmore Miami Beach, 1700 Washington Ave., Miami Beach, 305-673-7300, fillmoremb.com. Alan Doyle: 8 p.m., $34.50-$39.50. Rose & Alfred Miniaci Performing Arts Center, 3100 Ray Ferrero Jr. Blvd., Davie, 954-462-0222, miniacipac.com. Almost Ahba: 7:30 p.m., $37.38-$42.06. Aventura Arts & Cultural Center, 3385 NE 188th St., Aventura, 877-311-7469, aventuracenter.org. The Best of Doo-Wop Volume 11: With Cleveland Still & the Dubs, Kid Kyle, and Little Peggy March, 7 p.m., $51.89-$70.75. Parker Playhouse, 707 NE Eighth St., Fort Lauderdale, 954-761-5374, parkerplayhouse.com. Big Freedia: 9:30 p.m., $20-$45. Gramps, 176 NW 24th St., Miami, 305-699-2669, gramps.com. Catwalk: A Night of Vogue: With Gami, Gooddroid, and Bonnie Beats, 11 p.m., $10. 1306, 1306 N. Miami Ave., Miami, 305-377-2277, 1306miami.com. Cedric Gervais: 11 p.m., $40. LIV, 4441 Collins Ave., Miami Beach, 305-674-4680, livnightclub.com. The Commodores and War: 7 p.m., $30-$125. Magic City Casino, 450 NW 37th Ave., Miami, 305-649-3000, magiccitycasino.com. Corona Electric Beach: With Justin Martin, 3 p.m., Free. America's Backyard, 100 SW Third Ave., Fort Lauderdale, 954-449-1025, myamericasbackyard.com. Cristoph: 11 p.m., $10. Treehouse, 323 23rd St., Miami Beach, 305-614-4478, treehousemiami.com. Current Joys: With Gap Girls, 6 p.m., $12. Gramps, 176 NW 24th St., Miami, 305-699-2669, gramps.com. David Hohme: 10 p.m., Free-$20. Do Not Sit on the Furniture, 423 16th St., Miami Beach, 510-550-5067, donotsitonthefurniture.com. Derelict Daughter: 7 p.m., Free. Lagniappe, 3425 NE Second Ave., Miami, 305-576-0108, lagniappehouse.com. Furnace: With DZA and Silent Addy., 11 p.m., Free-$10. Black Market Miami, 168 SW First St., Miami, 305-400-8023, blackmarketmiami.com. GroundUp Music Festival: With Snarky Puppy, Andrew Bird, Lalah Hathaway, David Crosby, and others, 12-11 p.m., $85-$825. North Beach Bandshell, 7275 Collins Ave., Miami Beach, 305-672-5202, northbeachbandshell.com. Indicate: With Adisyn, Kamadev, Michael Gin, and Samihe, 6 p.m., Free. Wynwood Block, 2621 NW Second Ave., Miami. Lil Yachty: 10 p.m., $20/$30. E11even Miami, 29 NE 11th St., Miami, 305-305-6611, 11miami.com. Little Havana Social Club: With Miami Dade College Symphony Orchestra and special guest Federico Britos, 8 p.m., $10-$20. Koubek Center, 2705 SW Third St., Miami, 305-237-7750, koubekcenter.org. Maya Jane Coles: 11 p.m., $10-$40. Space, 34 NE 11th St., Miami, 305-375-0001, clubspace.com. Mor Elian: 10 p.m., Free. Electric Pickle, 2826 N. Miami Ave., Miami, 305-456-5613, electricpicklemiami.com. Neighborhood Watch: With Leyva, Masf, Oddöø, and Tridvsolo, 11 p.m., $10. Treehouse, 323 23rd St., Miami Beach, 305-614-4478, treehousemiami.com. Nightrain: 10 p.m., Free. Nancy, 2007 SW Eighth St., Miami, 305-397-8971, nancy305.com. Pigeons Playing Ping Pong: 8 p.m., $17. Culture Room, 3045 N. Federal Hwy., Fort Lauderdale, 954-564-1074, cultureroom.net. Sonny East Band: 10 a.m., Free. Lagniappe, 3425 NE Second Ave., Miami, 305-576-0108, lagniappehouse.com. Thomas Von Party: 10 p.m., Free-$10. Barter, 255 NW 27th Terr., Miami, 305-310-9720, barterwynwood.com. Tribalistas: 8 p.m., $48-$98. The Fillmore Miami Beach, 1700 Washington Ave., Miami Beach, 305-673-7300, fillmoremb.com. Tribalistas Afterparty: With Rose Max Samba Band featuring Pretinho da Serrinha, 10 p.m., $25. The Gleason Room — Backstage at the Fillmore Miami Beach, 1700 Washington Ave., Miami Beach, 305-673-7300, fillmoremb.com. Unlimited Devotion: 9 p.m., Free. Blackbird Ordinary, 729 SW First Ave., Miami, 305-671-3307, blackbirdordinary.com. Wicked Paradise: With Justin Jay, 1 p.m., free-$2,000. Delano Hotel, 1685 Collins Ave., Miami Beach, 305-672-2000, delano-hotel.com. Zendatta: The Police Tribute., 8 p.m., Free. The Wynwood Yard, 56 NW 29th St., Miami, 305-351-0366, thewynwoodyard.com. Attic Ted and Trevor Hagen: With Decide Today, Imbecile, and Alexandre Merbouti, 9 p.m., Free. Las Rosas, 2898 NW Seventh Ave., Miami, 786-780-2700, lasrosasbar.com. Faith Prince: 7 p.m., $45-$49. Aventura Arts & Cultural Center, 3385 NE 188th St., Aventura, 877-311-7469, aventuracenter.org. GroundUp Music Festival: With Snarky Puppy, Andrew Bird, Lalah Hathaway, David Crosby, and others, 12-10 p.m., $85-$825. North Beach Bandshell, 7275 Collins Ave., Miami Beach, 305-672-5202, northbeachbandshell.com. Jennifer Holliday: 6:30 p.m., $50-$1,000. Faena Theater, 3201 Collins Ave., Miami Beach, faena.com/miami-beach/bar/faena-theater. Laurent Megelgi's Trio: 8 p.m., $10. Le Chat Noir, 2 S. Miami Ave., Miami, 305-377-8899, lechatnoirdesalis.com. Michael Winograd and the Honorable Mentshn Band: 2 p.m., $10-$100. Julius Littman Performing Arts Theater, 17011 NE 19th Ave., North Miami Beach, 305-787-6005, littmantheater.com. Reggae Sunday: With Inna Sense, 2 p.m., Free. The Wynwood Yard, 56 NW 29th St., Miami, 305-351-0366, thewynwoodyard.com. Royal Portrait: With New World Symphony, 2 p.m., $15. New World Center, 500 17th St., Miami Beach, 305-673-3331, nws.edu/new-world-center. Vibrate: With Mattei, Bonnie Hrz, Alt2, and others, 9 p.m., $10-$20. Electric Pickle, 2826 N. Miami Ave., Miami, 305-456-5613, electricpicklemiami.com. 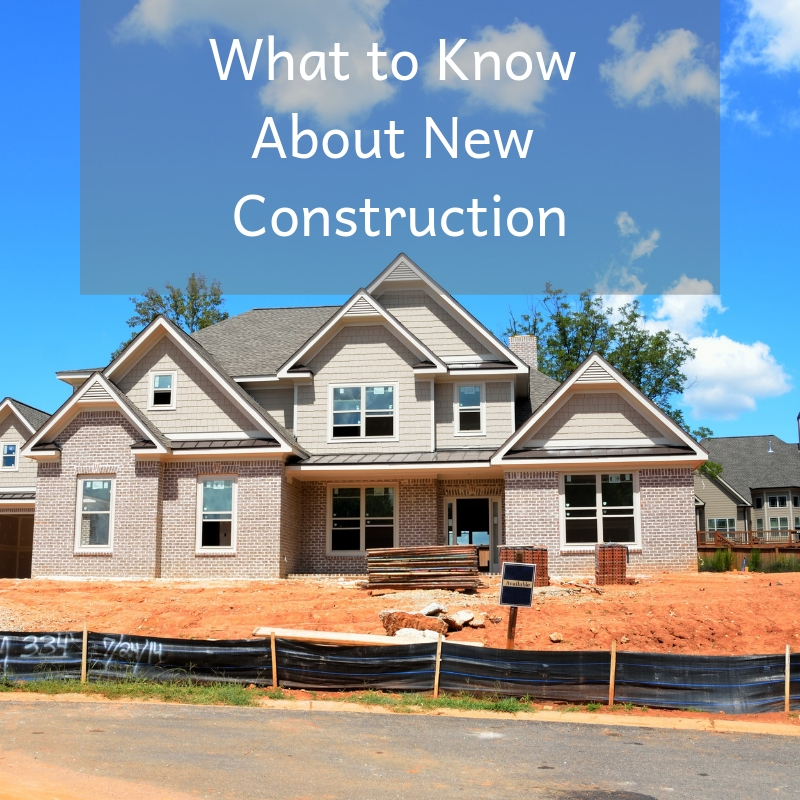 There are still a lot of new home construction projects going on around the Miami area and if you're planning on customizing a new home, you're probably looking to save some money along the way. 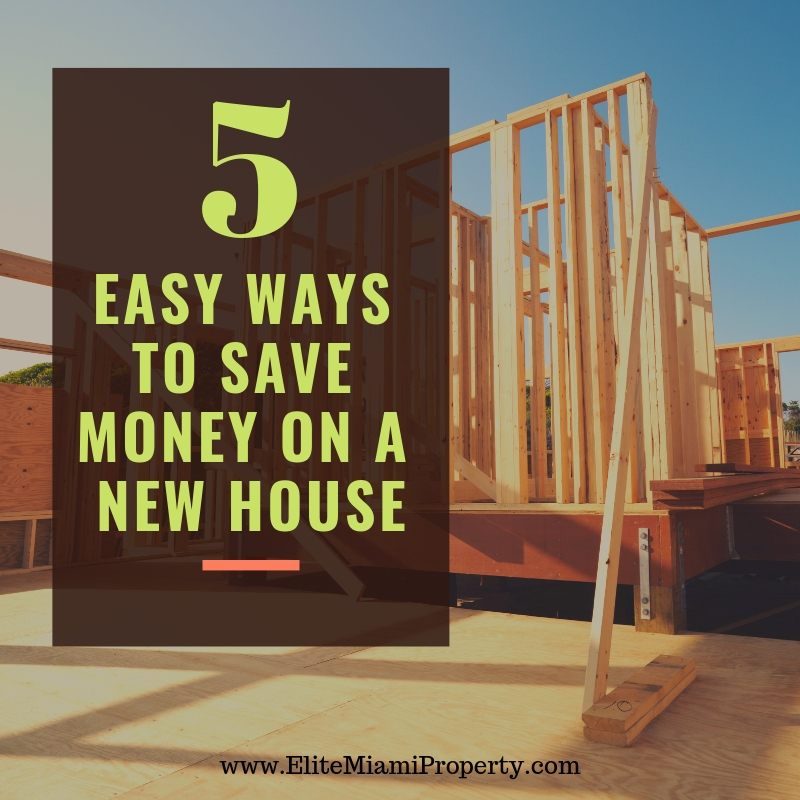 After all, upgrades here and improvements there can really add a lot to your budget so if you're planning on buying a new home or building one, start with these five simple ways to save yourself some dough. #1. Have your own real estate agent. Many of these new construction subdivisions and developments, even condo buildings will have their own real estate agents that help buyers facilitate a transaction, but, what most buyers don't realize is that those agents are working for the developer or the seller of the homes or condos in that division. Their main objective is to sell you a house. This may or may not be the best option for you so having your own representation that is completely unbiased and not affiliated with the development is really the best way to get the best deal. #2. Look for lower interest rates. Builders were looking to get their home sold quickly may actually buy down your interest rate making it more affordable for you. This is often best used if the buyer uses the preferred lender but it doesn't mean that you don't have a choice. Make sure you do your research and ask the builder if they're willing to buy down your interest rate. #3. Look for a move in ready home. A lot of the extra fees come in custom upgrades but if they've already created a home with all the upgrades you might want, it could actually save you money. This eliminates the construction weight which means that if you're renting you don't have to spend any more money on rental payments and you will need to choose all the fixtures, finishes, and features if the home has everything you want. Many of the upgrades are also included in this works especially well if you choose the model home. #4. Ask about builder upgrades. It typically cost builders far less to upgrade your flooring or countertops that it would cost you so looking for upgrades while you are building instead of after the fact could save you a lot of money. You might be surprised at what builders and developers are willing to "throw in" with the purchase of the house. #5. Ask about personalized floor plans. Many new homes have different options that give buyers some flexibility but these options can come at a higher cost. Depending on how motivated the builder is to sell you might ask about any personalized floor plans that would make it less expensive versus a customized floor plan. For more information on new home developments, subdivisions, and brand-new condos in Miami give me a call today. Let's discuss what it is you're looking for, your budget, and how we can save you some money on your next new home purchase. From too many homes on the market just a few years ago to home buyers having a problem finding a home that they really want, the housing market certainly has had its ups and downs and we're starting to get dizzy from the roller coaster ride. Demand is extremely high right now in just about every market across the country and home prices are starting to rise due to the increase in demand. Investors tend to outbid owner occupied buyers and even with today’s low interest rates the urgency has never been greater to jump on the home of your dreams. If you wait, investors will swoop in especially on short sales and distressed homes that can make a quick profit from flipping. So how do buyers jump on the ball ahead of investors and those ready to buy? Make sure you're preapproved for a home loan before even looking at homes. By knowing ahead of time that you can afford a particular price range and having a letter of preapproval in hand, sets you up for success. Have your offer ready to fill out. As your Miami agent, I can prepare an offer ahead of time and simply fill in the remaining specifics on any one particular property when the time comes. Write a letter to the seller specifically telling them why you want their home. Appeal to sellers by explaining your situation and why they should accept your offer over an investor. Make sure you have minimal contingencies and addendum’s so that there’s not a lot of hoops to jump through for sellers. Buying in Miami and Miami Beach is getting tough and there is still a lot of competition. If you’re a first-time home buyer or you’re looking to move up, give me a call anytime. I specialize in luxury homes and condos in Brickell, Miami, and Miami Beach. There are a lot of factors to consider when buying your first home but price should not be the only factor. 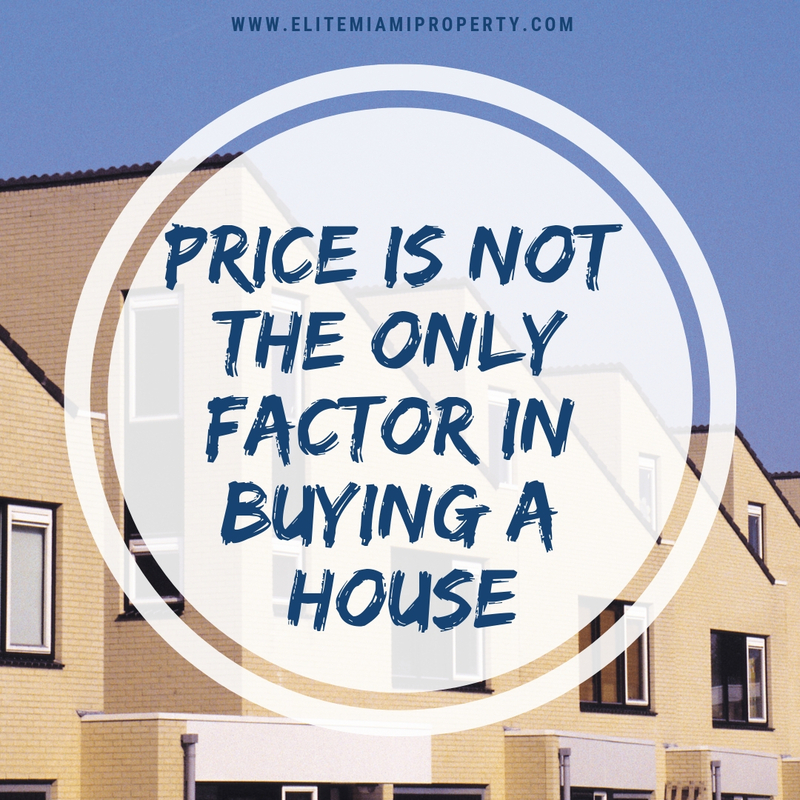 Of course, you have to consider price when you're looking in a specific price range, but there could be some of the things you're missing when you focus solely on the price. Probably the last thing you're thinking about when buying a home is selling it, but you do have to consider that, especially if this is your first home. Chances are, this won't be your last home, so consider how others might feel in the future. If you like the house now, somebody else will probably like it down the line, but it's important to look at all factors including resale value when buying a home. You may not have children but the next homeowner might and schools and certain school zones and service areas could be extremely important to buyers. It's something to consider when purchasing the home even if you don't plan on having kids for a while ... or ever. How much maintenance will the home is tail? Are you prepared for lawn care, keeping up with the construction of the home, replacing appliances? If you've rented up until now, taking on a new home can seem a little bit overwhelming so being prepared and simply understanding what you are responsible for can put you ahead of the game. A condominium might be a better option as it eases you into homeownership without the 100% responsibility for everything including the land. If you are going from a 900 square-foot apartments to a 3000 square-foot home your electricity and utility costs are going to practically quadruple. Make sure you understand what the utility costs are to a home before finalizing the purchase. You can ask the existing homeowner or get copies from local utility departments. You may be able to afford the home but not the cost of heating and cooling it. You may have found the perfect home only to discover the commute route is two hours from work through 37 stoplights and some of the worst traffic in the city. Before finalizing a purchase and sale contract on a home drive the commute routes during the heaviest times of the day so you have a good understanding of what your daily commute will look like. Buying real estate is so much more than simply the price tag. Make sure you understand what you are getting into with these simple additional search criteria. Who Owns What in an HOA?